The skiing region Val Gardena / Alpe di Siusi offers 175 km of slopes with 83 cableways and lifts and 98 km of cross-country ski trails. In addition there are incredible 500 km of connected slopes around the Sella Massif which are though NOT accessible with the ski pass Val Gardena / Alpe di Siusi. The Sellaronda stretches over 26 km and can be skied clockwise or anticlockwise (the Sellaronda is not recommended for beginners!). 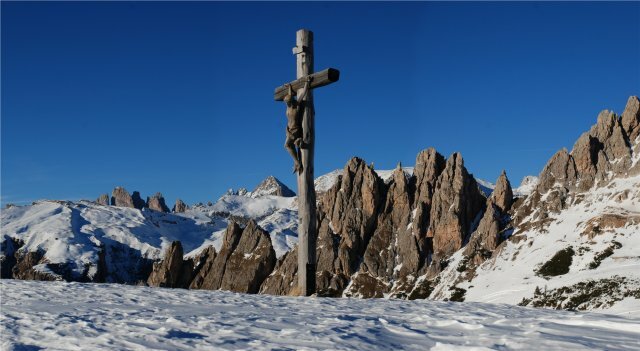 You should schedule about 6 hours for the Sellaronda and please pay attention to reach the last cableway or lift in time in the afternoon, as the slopes are officially closed by 5 p.m.
Fun Park for children on the Alpe di Siusi (chairlift Euro). The Dolomites offer innumerable ski touring possibilities on wide, non prepared, thus natural, slopes with a unique panoramic view. As off the slopes there is no slope service and there is great danger of avalanches, steep crevices, cliffs and passages, we recommend ski tours with an alpine guide.